Get through your tasks super quickly, with the world's first pocket hotspot to offer download speeds of up to one Gigabit-per-second (1 Gbps). And connect up to 20 wifi-enabled devices to the internet at any one time. Keep the whole family safe, with parental controls and rest assured that your connection, and your personal information, is always secure. Want to be able to get multiple things done quickly, wherever you are? 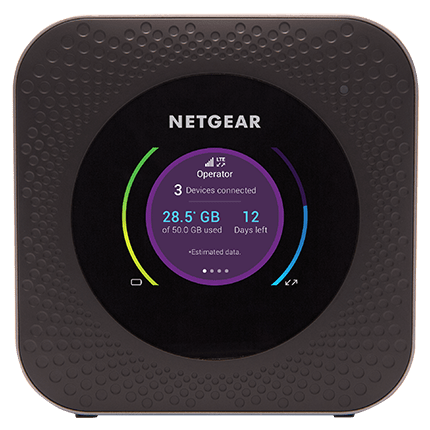 The Pocket Hotspot Pro Netgear M1 is the world's first pocket hotspot with download speeds of one Gigabit per second. So you can download large files, browse the web and stream movies more quickly, whether you're at home, away or on the go. The Pocket Hotspot Pro won't let you down and you'll get the very best experience every time. Want to connect more than one device to the internet at a time? No problem. The Pocket Hotspot Pro supports up to 20 wifi-enabled devices at once, including smartphones, laptops, tablets, gaming consoles and any other devices you may have at home or at work. And it's even got an Ethernet port, so you can connect a wired device if you want to. Share your wifi with friends and colleagues when you're out and about, rather than having to hunt for a public hotspot. And most importantly, rest assured that your connection, and your personal information, is secure. Managing your Pocket Hotspot Pro is easy, thanks to the free Netgear app for your smartphone or tablet. Use the app to view your connection and settings and to see how much data you’ve used. Worried about how much time your kids spend online, or what they're doing while they're there? Simple parental controls mean that you can limit the time they spend in the digital world and make sure they're always kept safe. And that's not all - the long-lasting battery means your hotspot will connect your devices all day, so it's a piece of kit you can really rely on. The Pocket Hotspot Pro is great for at home, as well as having all the security features to make it perfect for the office. Manage and control people's access, with password protected wifi and guest access. Block any devices you don't want sharing your connection. And get peace of mind, knowing you can filter content if you want to.